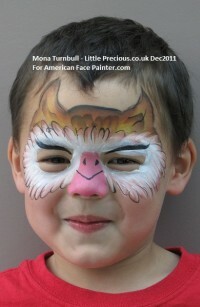 If you are looking for a face painter who is friendly and professional you have come to the right place. Offering face painting, baby bump painting art, mini makeover, henna and temporary glitter tattoos within Oxford, Oxfordshire, Berkshire and Buckinghamshire and the surrounding areas. Fully covered with public liability insurance. Mona Turnbull has won several awards. click here to view her achievements. 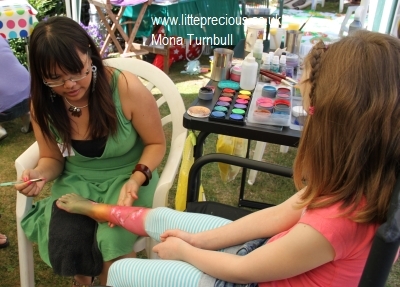 Mona Turnbull also has a Professional Body Painting website. 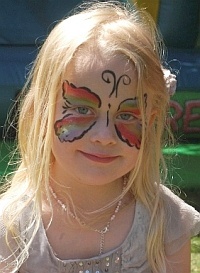 Only high quality professional water based face paints and glitters are used which are made for children's skin. Paints can be easily removed with soap, water and a flannel. All paints are EC and FDA approved for use on the skin and glitters are all cosmetic grade. Mona Turnbull FACE member 424. I am a proud member of FACE Association.